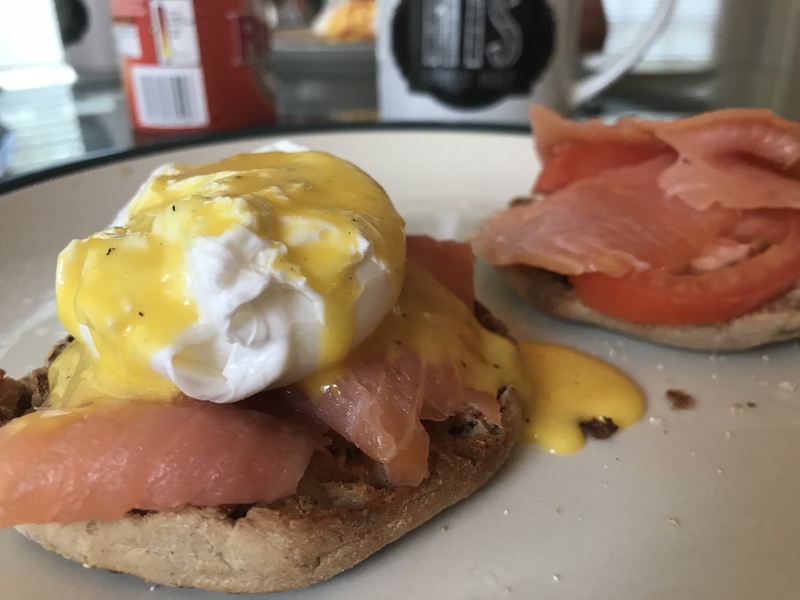 I had never poached eggs until this weekend and holy moly – it’s a lot easier than I thought it would be. I never seem to get the timing just right on hardboiled eggs and I’ve ripped a number of omelets in the flipping process – trust me, it wasn’t pretty. On Saturday, JP and I went to BJ’s Wholesale for our biweekly grocery haul and I had decided to change up some of my fat sources as well as my vegetables. We typically get our vegetables and fruits based on what’s on sale, however, going to the wholesale club drastically decreases the cost of items like blueberries, avocados and bell peppers. We still try to be mindful of how much we’re investing into our groceries in cost as well as our taste buds – when you buy bulk you are dedicating many meals to these items. This haul resulted in whole eggs, avocados and smoked salmon as new fat sources. Blueberries, potatoes, green beans and bananas as newer vegetable and fruit carbohydrate sources. After I got the haul home, I thought long and hard about what I wanted to do with the parts I bought. Since I’ve changed my first rest day to Sunday, the first thing I thought about was breakfast and I got to searching. First of all, I looked at a few different sites to poach an egg and I wish there had been more consistency because some were just awful. The first one resulted in an egg in the trash – so sad. Thankfully, after reading through more recipes I was able to get it right. Fill a medium-sized pot with water and set to medium high heat. You want to get the pot to a low boil. Once, the water is at a boil, add 1 to 1 and a half tablespoons of white distilled vinegar. Crack an egg into a cup or small container that you can use to help slide the egg into the boiling water and turn the temperature down a little. Once the egg is in the water, set a timer for 2 minutes. Using a slotted spoon, gently scoop the egg and shake off any water. The vinegar helps prevent the egg whites from separating and as the water boils the whites start to cook into themselves and appear as though they were cooked in the shell of the egg. In a regular bowl (what I call a cereal bowl), beat egg yolks only with 1 tablespoon of water and 2 teaspoons of lemon juice. Mixture will be a bit fluffy and frothy. Transfer mixture into a small pot over medium heat. Allow pot to warm up and then start stirring or whisking. I have a small whisk, a traditional size whisk may be too big and you may want to use a fork. Continue to whisk for about 5 minutes or until yolk mixture has appear to slightly cooked. As your whisking, the mixture will become more fluffy and increase in volume. The coloring will also darken. Once it appears that is has cooked, remove from heat and mix in butter. Add salt and pepper to taste. You can also add cayenne for spice – JP tops his with hot pepper sauce instead. If you want to add a grain, I would recommend toasting it so that it’s sturdy. You could also eliminate the grain and add starch like a baked red potato or sweet potato. If you’re interested in keeping it lower carb you can have the egg without a grain or starch. Layer sliced salmon on top of toasted English muffin. Finish off with a spoonful or two of Hollandaise sauce. 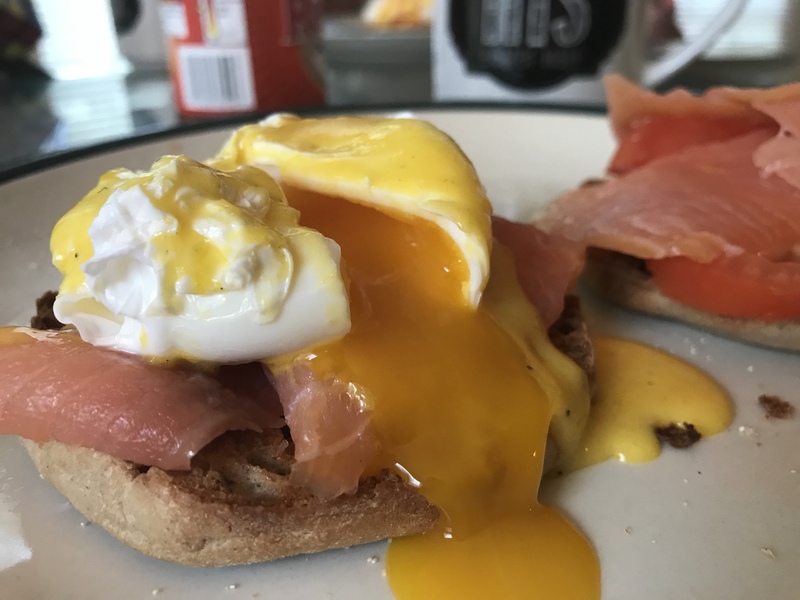 Keto/Higher fat diets: for those who do follow a higher fat, lower carbohydrate diet and are looking for healthy fats to incorporate into breakfast, the poached egg with smoked salmon may be a good option. The Hollandaise does also have yolks and butter, which do contain saturated fats so moderation should be practiced – this isn’t a meal I would necessarily recommend for every day, but if it’s balanced with other lean proteins and other unsaturated fats, I don’t think it’s a problem. Paleo/Whole Foods approach: Eliminating the grain and substituting for a different base (if desired) could be a good approach. You can also change out the butter for a paleo/whole foods approach approved butter or ghee.